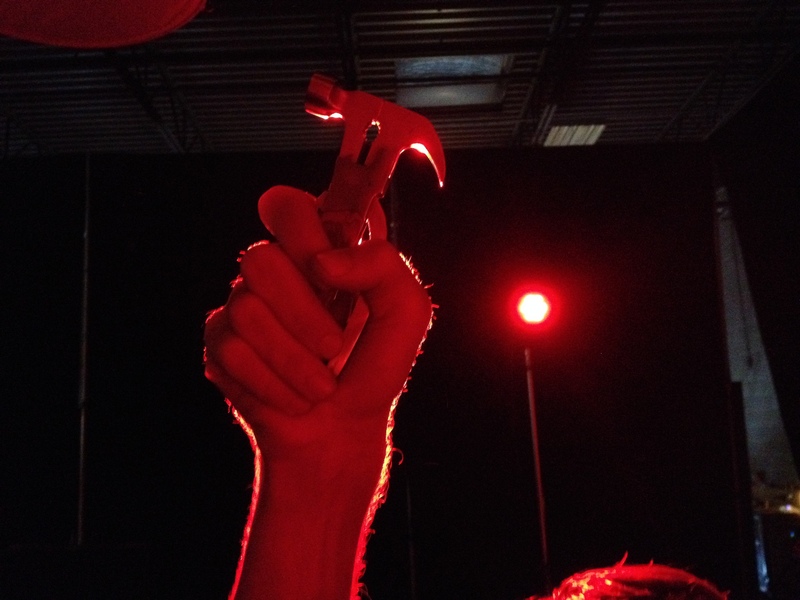 A picture of a small hammer. As far as I know, this one is NDA-proof. The production schedule worked out very nicely, considering that most of the crew had regular day jobs. We’d be shooting weekdays after everyone got off work, then would pick up our bigger scenes during the weekends. This allowed me to work my internship at 15Four from 9 to 5, then head over to Z*Con until midnight. I worked that schedule for most of July and August. I was effectively lighting my wallet on fire in exchange for a gasoline budget, but the knowledge I gained, connections I made, and memories I earned more than made up for it. I can’t talk much about Z*Con out of respect for my non-disclosure agreements, but I can say that I’m incredibly excited by the lighting design, camera work, makeup, and stunts I saw. I don’t think anyone on the production really realized how awesomely crazy some of the stuff we achieved would get. We’d end our nights by swapping stories and watching planes fly in over our warehouse location. The communal realization that we were making a Big Damn Film was something to be experienced. 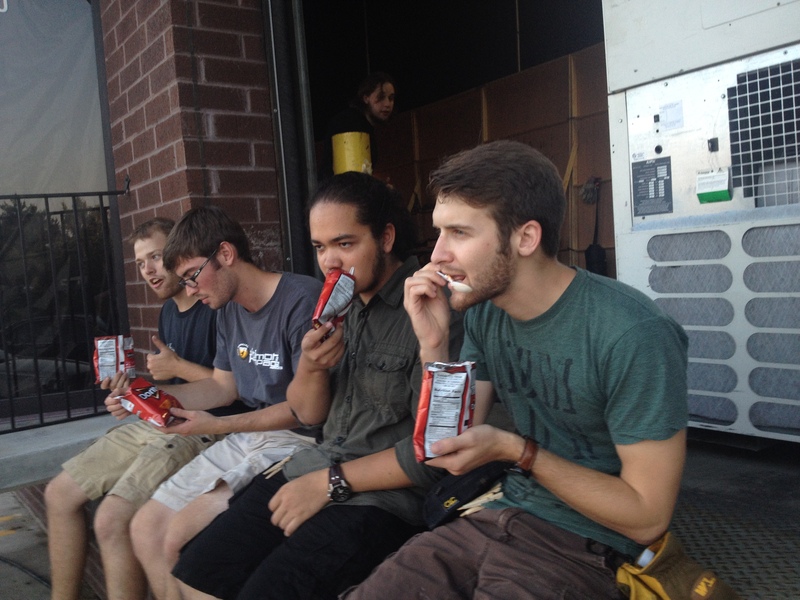 Eating a snack on the last day of shooting. This was my first exposure to working the full duration of a feature with a sizable grip and electric package. The film takes place in a convention center, so our rigging team wired a warehouse to simulate the lighting of a comic book convention. Beyond our massive 6K space lights, we had multiple 2Ks and 1Ks for composing our lighting design in depth. Our first two or so weeks were harrowing as our fairly young crew of Lighting Technicians and Grips worked to become “seasoned professionals,” under the direction of our DP, Gaffer, and Key Grip. We ended the production like a well-oiled machine, and I’m proud of the work we achieved and relationships we formed. My post-graduate life continues to provide me with an upset stomach, which is probably a healthy thing. I feel blessed to have these opportunities because every day has presented itself with an opportunity to grow, to learn, to expand and to create. I loved all that school provided me because of its structure and its consistence. When you’re left to create the structure yourself, you’re only accountable to yourself. There is an excitement and a power in that, but damn if it isn’t scary sometimes. However, there came a moment this final semester where I was so overloaded with work and stress that I knew I had to get away. Arbitrarily staring at the wall, I whispered to myself… lobster.